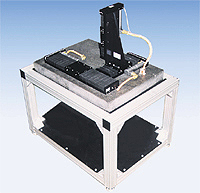 All three axes use standard positioning tables mounted to a granite slab. The granite slab is supported by an aluminum structure. All three axes have the servo motors wrapped along side the tables to reduce each axis overall length.